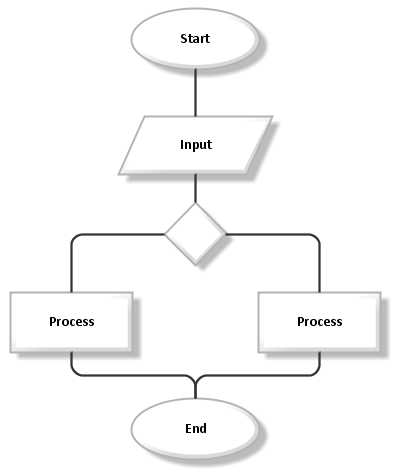 A flowchart describes processes and systems. The different branches of the flowchart have a specific order to illustrate the desicion paths. A flowchart can be used for a logical representation of process flows and possible variations. It is a useful means of planning and explaining operational processes and workflows. Problem solving can be organized and procedures be visualized. Functional interrelations and the temporal sequence of processes are illustrated. The free modeling tool ARIS Express supports the modeling of flowcharts with its model type 'General diagram'. With ARIS Express, you can create flowcharts in three ways using the model types “BPMN”, “Business model”, and “General diagram”. Flowchart symbols comply with DIN 66001. Start: Every flowchart begins with a start. The start is the entry point of the process. Only one start is allowed per flowchart. End: A flowchart always culminates in an end. The end marks the completion of a process. Only one end is allowed per flowchart. Processing steps: A process step describes a specific subprocess that is performed within the process. The level of detail can be chosen freely. Decision: A decision has an input (top) and multiple output (left, right, and below). Within the diamond, the condition is listed textually. The output is then filled with the relevant values ​​(yes / no, etc.). Data: It illustrates information or material that is input for or output of a system. An input may be a customer order, for example, while an output could be a product to be shipped.